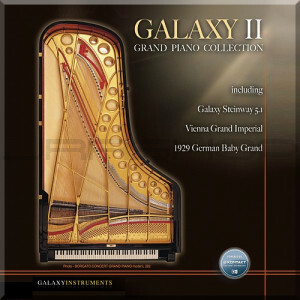 Galaxy II contains three grand pianos: the Vienna Grand (a powerful Bösendorfer Imperial), the 1929 German Baby Grand (a Vintage Blüthner baby grand), and the 5 star awarded Galaxy Steinway in stereo and 5.1 surround. Galaxy II K4 is based on the new Kontakt 4 engine by Native Instruments, presenting new features, better performance and a completely redesigned direct access user interface. All pianos of the Galaxy II Pianos Collection (Steinway, Vienna Grand, Baby Grand) are available as single downloads at SoundsOnDemand! The upcoming version Galaxy II K4 is based on the Kontakt engine by Native Instruments, presenting new features, better performance and a completely redesigned direct access user interface. Version 4 offers true half pedaling, true repedaling and dynamically playable pedal, damper and string noises when using a continuous sustain pedal. Additional resonance release and noise samples have been added and all the 30GB of samples of Galaxy II have been revised and enhanced. Galaxy Pianos Version 4 takes the Galaxy II Grand Piano Collection to an new level. When ordering an Update from Galaxy II KP2 your legal registration will be checked when activating Galaxy II K4. When ordering an Upgrade from a Download Pack or OEM Steinway (single Piano) you have to enter the serial number of your download / OEM license as a proof of purchase into the message field at the checkout. Your order will be shipped after a successful verification! Galaxy IIs Vienna Grand is comprised of sampling a BOESENDORFER IMPERIAL 290 grand piano. Established by Ignaz Bösendorfer in 1828, Bösendorfer are the oldest piano manufacturers still in production and have a history of constructing some of the worlds finest instruments. The Model 290 Imperial, a 96 grand piano, is famous for its powerful soundboard and its extended keyboard; going as far as a bottom C0, making a full eight octave range or 97 keys. Sometimes, these extra keys are hidden under a small hinged lid, on others, the colours of the extra white keys are reversed (black instead of white). The extra keys are added primarily for increased resonance from the associated strings; that is, they vibrate sympathetically with other strings whenever the damper pedal is depressed thus creating a fuller tone. With the VIENNA GRAND they are playable. The Blüthner piano company has been manufacturing the Europes finest pianos in their factory in Leipzig, Germany since 1853. By 1885, the company was the largest European piano manufacturer. Numerous royals, composers, conductors, artists and performers have owned Blüthner pianos. They include Brahms, Bartok, Debussy, Tchaikovsky and Wagner. Blüthners have also been used in popular music. One was used on The Beatles Let It Be album, most notably, in the hits Let It Be and The Long and Winding Road. Galaxy IIs 1929 GERMAN BABY GRAND is based on a BLÜTHNER Model 150, built in 1929. This beautiful 75 year old grand piano features a warm , vintage sound wíth a wonderful intimate tone.